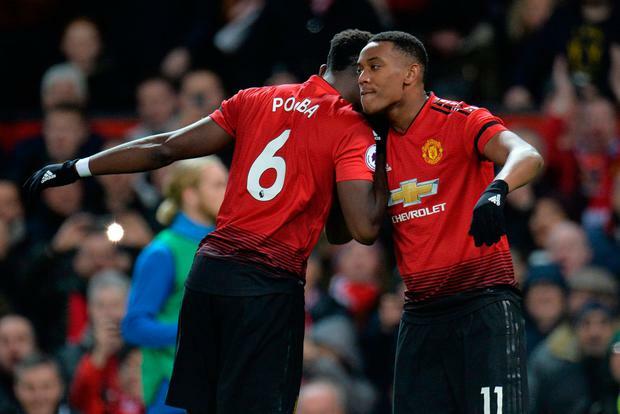 Jose Mourinho's decision to axe struggling Romelu Lukaku from his starting line-up was ultimately vindicated as goals from Paul Pogba and Anthony Martial earned their team three badly-needed points and avoided the embarrassment of seeing Manchester United slip out of the top 10. But not for the first time this season, it was a far from convincing performance from Mourinho's side as a late Gylfi Sigurdsson penalty left the hosts with an anxious final 13 minutes to negotiate. Ultimately, Everton were left to rue a string of missed chances - most notably from the Brazilian Bernard - as United improved on a miserable run that had brought just one win from their previous seven games. But as he watched his countrymen clinch the win, goodness knows what United legend Eric Cantona, sat in the Old Trafford stands, made of his former club's current travails. More mobile and pacy without Lukaku as the fulcrum of their attack, at least Martial had a hand in both United goals - although the first was not without a fair degree of controversy. Everton were livid that Idrissa Gueye was judged to have tripped Martial as he darted into the area after 27 minutes although, in truth, they could consider themselves fortunate that then midfielder was not sent off, having picked up a yellow card five minutes earlier. Pogba conducted his trademark stroll-up, taking 26 stuttering steps before seeing his penalty saved magnificently by Jordan Pickford although, fortunately for the taker and not the keeper, the ball broke for the United man to tap into an empty net. If that was fortunate and controversial, United's second, after 48 minutes, was nothing of the sort as Martial doubled the lead. A United attack was cleared from the area by Kurt Zouma, but only as far as Pogba who squared the ball for his fellow Frenchman to curl a magnificent right-foot shot past the diving Pickford from 18 yards, one of those shots that was destined for the far corner from the moment it left his boot. Everton had responded well to United's first and replied even more impressively to going two-down, Sigurdsson and Richarlison carving holes through the middle of the home defence and sending Bernard racing clear. The Brazilian winger even succeeded in rounding David de Gea - no mean feat - but as the Everton supporters behind that goal began to celebrate, Bernard somehow rolled the ball into the side-netting from a wide angle. It was a hammer blow for the visitors and one which might have worsened moments later when Marcus Rashford also found himself clean through on the keeper, only to be denied by Pickford's outstretched leg. Pogba followed suit in discovering the form that England's number one currently possesses, his clever run, and Juan Mata's equally clever pass, resulting in a shot which Pickford saved well at the foot of his post. It was a slightly harsh sequence of events for Marco Silva's team, looking for a fourth straight league win after a halting start to the season. Their response to United's opening goal could have brought an equaliser, with Sigurdsson heading straight at David de Gea from a promising position, Theo Walcott placing two chances too close to the United keeper and Richarlison opening the second half with another shot to test United's keeper. Everton were finally rewarded for their endeavour after 76 minutes when Pogba lost the ball to Sigurdsson and the Icelandic international sent away Richarlison who was clumsily grounded by Chris Smalling for the second penalty of the game. Sigurdsson took a more orthodox approach to his spot kick than had Pogba, blasting an unstoppable shot past de Gea into the far, right-hand corner. United negotiated the final minutes although a lacklustre display was summed up in injury-time when Martial was played clean through on goal but was denied by Pickford. Kevin Palmer Arsenal manager Unai Emery has confirmed he will shake up his starting line-up for today's Premier League clash against Crystal Palace at Emirates Stadium. Kevin Palmer Liverpool manager Jurgen Klopp has revealed he 'felt sorry' for Manchester City after their agonising Champions League defeat against Tottenham last Wednesday. Mike Whalley Ole Gunnar Solskjaer has warned Alexis Sanchez and his team-mates that Manchester United cannot afford to carry players if they are to halt the club's decline.